Ephemeris for Tuesday, March 19th. Today the Sun will be up for 12 hours and 5 minutes, setting at 7:53, and it will rise tomorrow at 7:46. The Moon, 1 day before full, will set at 7:55 tomorrow morning. Today and tomorrow are busy days, astronomically speaking, for the Earth, Sun and Moon. This afternoon at 3:47 the Moon will reach the perigee point in its orbit of the Earth, its closest point of 223,200 miles (359,400 km) center to center. With the full moon just 30 hours later this will make the Moon a super-moon, the third in a row. The Moon will be full enough to call tonight’s moon a super-moon too when it rises around 6:16 p.m. 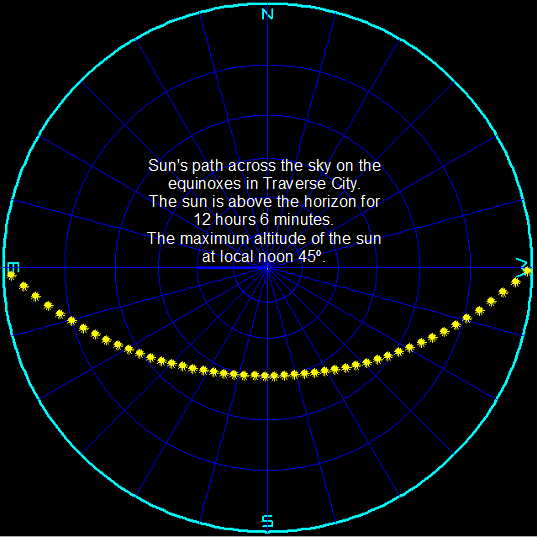 The next event will be the coming of spring, when the Sun appears to cross the celestial equator heading northward. For a point in the Pacific Ocean, on the equator the Sun will be directly overhead at 5:58 p.m. our time or 21 hours, 58 minutes Universal Time or Greenwich Mean Time. 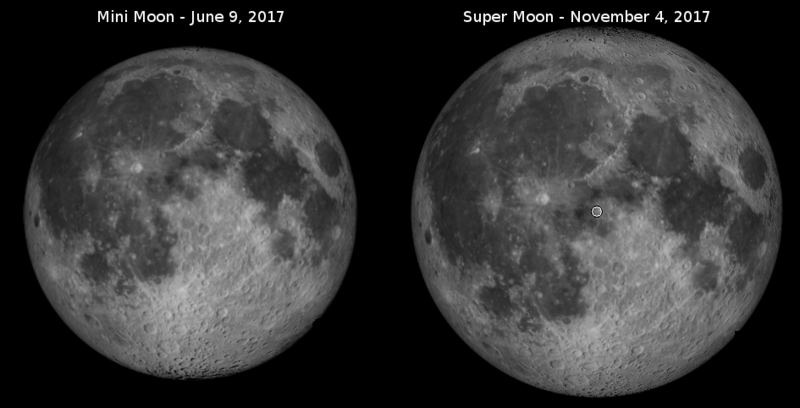 Mini Moon and Super Moon for 2017. Trouble is the Moon appears alone with nothing to compare it to when it is seen in the sky. Created using Cartes du Ciel (Sky Charts). 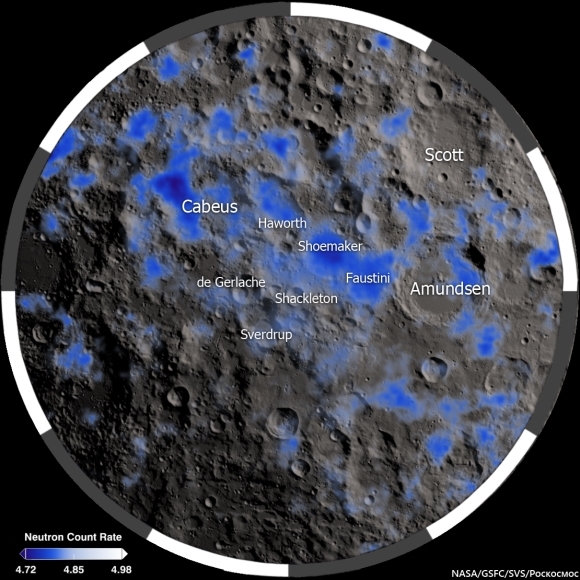 03/12/2019 – Ephemeris – Does the Moon rotate? Ephemeris for Tuesday, March 12th. Today the Sun will be up for 11 hours and 43 minutes, setting at 7:44, and it will rise tomorrow at 7:59. The Moon, 2 days before first quarter, will set at 2:00 tomorrow morning. Since we see only one face of the Moon throughout the month does that mean that the Moon doesn’t rotate? It doesn’t appear to rotate with respect to the Earth, but the Moon rotates through all the stars and constellations of the zodiac in a 27.32 days. That’s called a sidereal month. The lunar month we’re more familiar with is the synodic month, or lunation, that lasts 29.53 days which is the interval between new moons. It is the basis of the Jewish and Islamic calendars. The reason for the locking of the Moon’s rotation and revolution of the Earth, also called synchronous rotation, is the tidal pull of each on the other. The Earth has managed to slow the Moon’s rotation to match its revolution. The Moon is trying to do the same to the Earth with much less success, though every year or two a second is added to the time stream, UTC1 or Greenwich Mean Time, due to the slowing of the Earth’s rotation. Animation of the Moon orbiting the Earth showing the Moon’s rotation. Credit: NASA’s Scientific Visualization Studio/Ernie Wright, modified and converted to GIF by Bob Moler. NASA’s Scientific Visualization Studio web page where I got the original for the above video. 03/11/2019 – Ephemeris – The Moon: Dark side, far side, which is it? Ephemeris for Monday, March 11th. Today the Sun will be up for 11 hours and 40 minutes, setting at 7:43, and it will rise tomorrow at 8:01. The Moon, 3 days before first quarter, will set at 12:54 tomorrow morning. Tonight the Moon is at its crescent phase, meaning it is slightly closer to the Sun than the Earth is. Most of the Moon we see is in night. Some earth shine may be seen on its night side due to the big nearly full Earth shining on it. I get ticked sometimes when someone who knows better, especially in the media, mentions the dark side of the Moon when they should use the term far side, the part of the Moon that permanently faces away from the Earth. When the Chinese Chang’e 4 spacecraft landed on the far side of the Moon recently many headlines proclaimed that it landed on the dark side of the Moon. The Moon has a night side, as does the Earth, but that changes as the Moon rotates in the sunlight. And the Moon does rotate. It happens to be in sync with its revolution about the Earth. 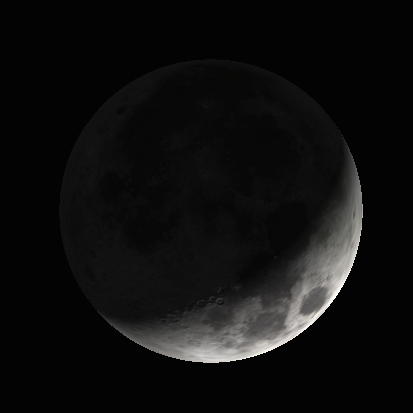 The crescent Moon tonight at 9 p.m. EDT, March 11, 2019. Created using Stellarium. Demonstration of the Moon’s crescent phase with the Styrofoam moon ball we use for Project Astro held up to a light off frame to the right. 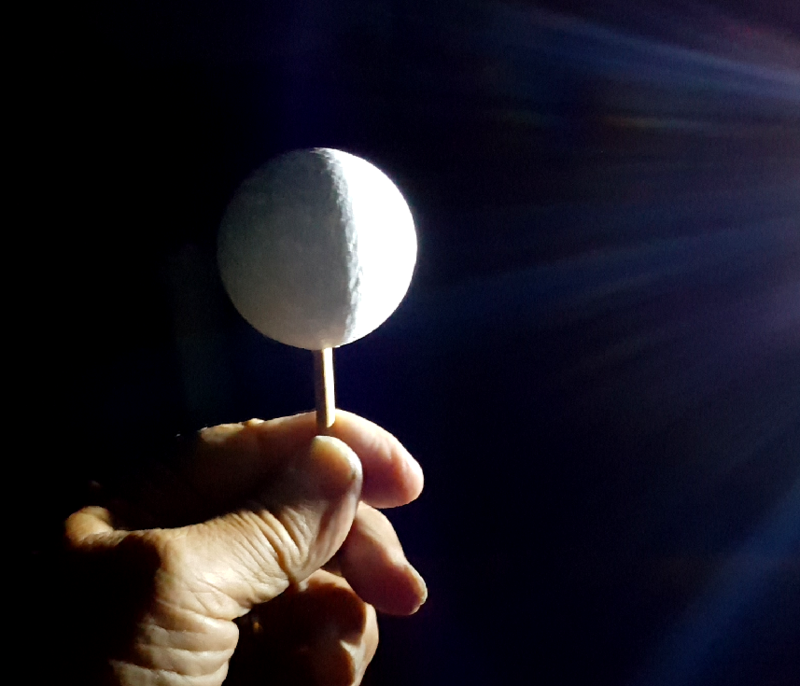 The night side of the ball is illuminated a bit by the translucency of the ball, and the reflection off my hand. Note the roughness of the ball is visible only at the terminator. The Earth and Moon if seen as a crescent, near side, far side, sunlit side and earth shine. Credit: me. Ephemeris for President’s Day, Monday, February 18th. Today the Sun will be up for 10 hours and 36 minutes, setting at 6:15, and it will rise tomorrow at 7:37. The Moon, 1 day before full, will set at 7:52 tomorrow morning. Ready for some math this morning? This will be easy, because you will only have to think about it. Let’s say the Earth’s radius is 4,000 miles. That is pretty close to its actual value. OK, it is 3961 miles (6,378 km) at the equator. The Earth is nearly spherical. At 4 this morning the Moon passed perigee, its closest point to the Earth, making tomorrow’s full moon a super-moon. Let’s say it will be at today’s distance of 221,600 miles (356,800 km). That’s center to center. At moon rise or moon set the Moon is near that center to center distance, but if it moves overhead it’s 4,000 miles closer because we are on the Earth facing the Moon. Even though the Moon looks smaller than when it appears on the horizon. It’s an optical illusion that the Moon appears larger when it is rising. Super moon or not. 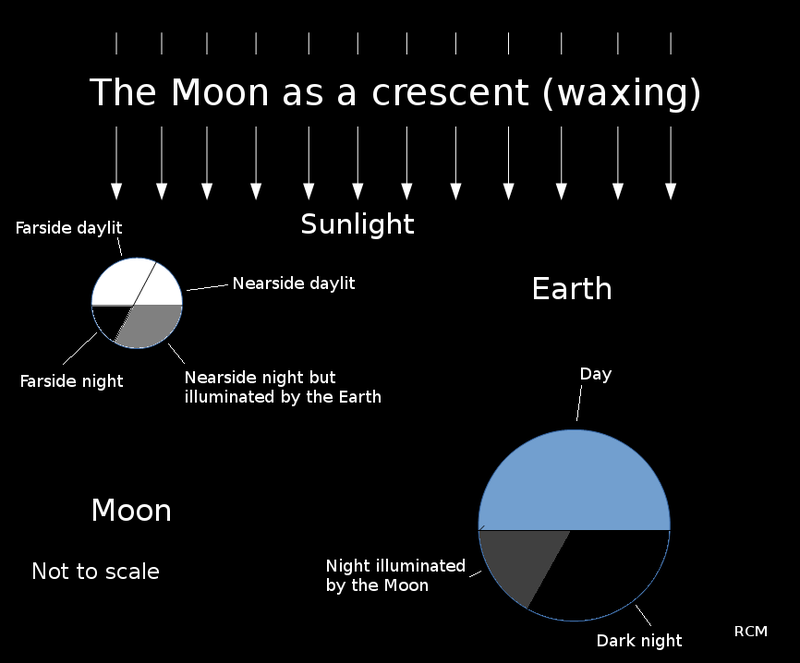 This illustrates the difference in the Moon’s distance at rising (or setting) versus when it is overhead. BTW today’s perigee puts the Moon at only 56 Earth radii from the Earth. The illustration is mine. Ephemeris for Tuesday, December 11th. The Sun will rise at 8:10. It’ll be up for 8 hours and 52 minutes, setting at 5:02. The Moon, half way from new to first quarter, will set at 9:06 this evening. Last Friday the Chinese launched their Chang’e 4 spacecraft to land on the far side of the Moon in January. That side of the Moon has been mistakenly called the dark side. It actually gets more sunlight than the near, Earth facing, side. This will be an extraordinary feat. So how can they tell what’s happening on the other side? In preparation for this landing attempt the Chinese put a communications relay satellite in a halo orbit about the Earth-Moon L2 Lagrange point 38 thousand miles (61 thousand km) beyond the Moon. It is a kind of a gravitational point of equilibrium behind the Moon. One of five, and they are very useful. The satellite will lazily orbit that point, in view of the lander and the Earth for continuous communication between the Earth and the lander. Chinese mission to land a lander and rover on the far side of the Moon. Click on the image to enlarge. It’s in Chinese except the numbers. Credit China Aerospace Science and Technology Corporation via Space.com. How Queuiao, the lunar communications satellite orbiting L2 performs its relay function. Click on image to enlarge. Credit CNSA via gbtimes.com. Note: Next Monday’s program will be about Lagrangian points.